This year’s planning for ‘Pyrenees 2014’ started with a shorter lead into than 2011 trek due to the experience and planning of other squadron activities, so back in November 2013, the initial letter went out and presentations by myself from the previous trek to encourage interest from the over 16’s. 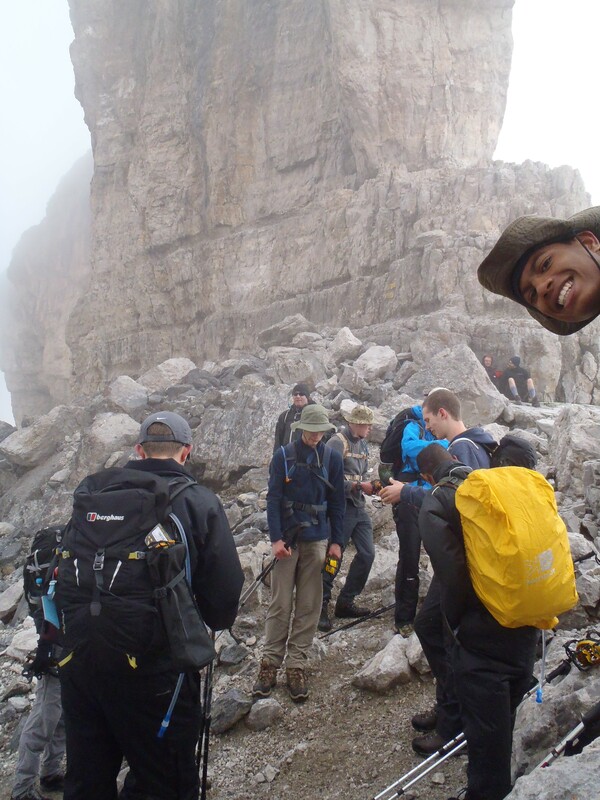 10 cadets took up this year’s challenge to complete the 5 day trek to include climbing Mt Perdio (3355m) in Spain. The cadets were set the task of choosing their national and local charity which they came up with Parkinson’s UK and Swindon Children Without a Diagnosis and along with the rest of the squadron coming up with different ways to raise money for the trek, this included applications to different trust funds for adventure activities for young people, letters to local companies, car parking duties, bag packing, cake stalls, laser quest evening, night hike and cadet contribution. On Thursday 3rd July 10 cadets, 2 staff from the squadron and our guide for the trek Keith Gault of www.hillways.co.uk arrived at 0900 at the Squadron to travel to Bristol Airport for the short journey to Toulouse. All went well and arriving into Toulouse to rain, it took a while to collect the cars, so it was a little busy getting on to the motorway. We got a little lost coming out of one of the tolls, with rain for the whole journey, so arrived a little later than planned in Gavarnie. We were met by our hosts for the evening Bernard and Roselyne Fillastre who gave us a warm welcome, and cooked us a typical French 4 course meal. After evening meal we had a staff brief from Keith as, when we arrived Keith set about finding out information about the conditions of our planned route and weather forecast. The plan had to change as the ‘the ladder’ section of the route still had ice and there would be a lot more snow around this year and there was a risk of thunder and lightning to contend with late afternoon. So the morning arrived after a good sleep for everyone, a plentiful breakfast and our last shower for a three days. We had packed our rucksacs with all that would be required for the trek, leaving our suitcases and non-essentials at the hotel. We then discovered a few cadets had forgotten the essential waterproof jacket or trousers. The weather wasn’t being very kind so the credit card of the OC had to be used before we could get going… the decision to change the route was a good one due to this. We then drove up to a car park at Col De Tentes and on route we had to stop for a lot of sheep having a rest and I had to get out to move them on to allow us up the hill. Once at the car park we got ourselves sorted, took our team photo, and it was a little chilly and getting wet as we started off, up an easy track, making sure we stayed away from the edge. Even though it was cloudy you could feel that when it cleared the views and experience would be awesome. We arrived at the col French/Spanish border 2273m in cloud and had a quick break to sort layers and check everyone was OK.
We then proceeded to take a left and use the HRP route Alta Ruta Pirenaica (Pyrenean High Route), towards the Goriz Hut, and we stopped about an hour later for lunch and the cloud level started to clear. The route was starting to get a little tricky after lunch and the first use of crampons were required for the first ascent of the day. The weather was improving but still overcast as we used the crampons to zig zag up. Our first experience of height and team photo taken we then proceeded to complete the last up of the day and first view of the hut – Refuge de la Roland at 2587m and the largest waterfall in Europe Grande Cascade de Gavarnie. A short walk to the hut and we were able to take off the crampons, waterproofs and find places to hang our kit. We were able gain access to the rooms as the weather wasn’t great outside and the cadets first experience of a mountain hut, 30 people in a room, we got ourselves organised with a bit of team work due to the space and height of the beds. Cadets and staff either used the communal room to play cards, read a book or take a sleep before the weather cleared and the first views of the Brecha de Rolando and some much needed warm sun! After an interesting sleep, we woke and sorted ourselves, ready for breakfast, making sure we ate enough to start the major climb of the day Brecha de Rolando gathered all our kit together. The weather was a little overcast, so most wore their trousers, fleece and waterproof jacket and the crampons had another work out this morning due to the snow line coming right down to the mountain hut. The cadets worked well together to the first stop half way up to Breche de Rolando which from the hut looks like you are very close but it’s very much like a false summit. Two cadets crampons worked loose, which were sorted by staff and meant cadets had a little rest, and team photos were taken as when you get to Breche de Rolando you can’t really take photos. Due to the height of the gap in the wall, it was very windy, with lots of other intrepid explorers trying to pass through. We split the group into 3 once we were on the last 400m towards the gap, to be able to take crampons off, then to walk over rocky ground to put them back on again before the easy and fun part to walk down where the snow line would finish for the day. We then took our crampons off and made our way to the lunch stop – cadets and staff this year brought their own lunches, and this was the first time to really start making the rucksacks lighter and to find a little more room in them. After lunch we made our way to the col and our last views of the Breche de Rolando. We had been walking with a group of Japanese tourists for the last 2 days and their guide took our team photo for us. We then made our way towards the hut Refugio de Goriz, this would take about 2 hrs, moving across a few wet snow patches, where we had our first view of the marmot; they are very intriguing animals, happy to watch you walk past and take photos. The weather had started to warm up, so most had taken off any waterproof layers and were just wearing a fleece, and by the time we reached the hut it was possible to just wear a t-shirt and shorts which was a great feeling. Cpl Goddard – This hut was on the Spanish side of the Pyrenees, which meant lots and lots of Spanish hikers. The place was full of happy and exhausted hikers waiting for a comfy bed. Today was the day we would take 7 out of the 10 cadets up to 3355m above sea level and reach our goal of Mt Perdido. 2 of the cadets were unwell and the other had reached their maximum on day 2 route. The day started early 0730 walking up the relatively easy section, and then moving over the boulders towards the lake Lago Helado. We put the crampons on and layered up, you could start feeling the weather change, it had been a dry day but windy most of the day so far, but the cloud was starting to develop and Mt Perdido was being a little bit of a mystery. It was pretty slow going up to the saddle before the last height gain of day, other groups were around. Cpl Goddard’s rucksack cover had come off with one of the gusts of wind, we thought we had lost it, but someone had caught it before it went over the other side and had it in their hand when they were walking down. We had a short break before I was allowed to lead the last section to achieve our goal and reach 3355m Mt Perdido. I felt very honoured and privileged to be able to lead the 7 cadets to the top, and all had worked very hard that morning. Once reaching the top and as they passed me I gave the high 5 of congratulations and big hug to Dave Russell and Keith Gault for getting us to this amazing feeling. We all took our photos by the cairn and team photos with the flags. I was also able to hand out a Silver DofE Award to Cdt Marianne Szymanski who had recently completed her award. So now it was time to make our way back down safely, as it was steep we still needed to keep concentrating and making sure we were using the crampons correctly. We made our way down to the lake, took crampons off and waterproofs, made our way across the boulder area only to realise we hadn’t yet made a snowman, so along with a few cadets made the smallest snowman and made our way back to the group. Once out of the snowy ground we headed back to the hut, the rain decided it would make an entrance for a short time, we quickly put on our waterproofs and the ground was then very slippery, so more care had to be taken until we reached the hut. Once all back and sorted, just before the evening meal, the sun came out and we were able to put our clothes out to dry and so we got the charity t-shirts out and took a few photos that we were unable to do at the top as we all needed to wear our waterproofs to keep warm. The evening finished with an evening meal and making sure we had everything together to leave in the morning for a long walk out to our next hut and remembering what the cadets had achieved today. Cdt Marianne Szymanski – I could hardly believe it when I finally looked up and there was only 10 metres to go! There was a bigger surprise when we reached the peak- I had my silver DofE award presented, right at the top of Mount Perdido! 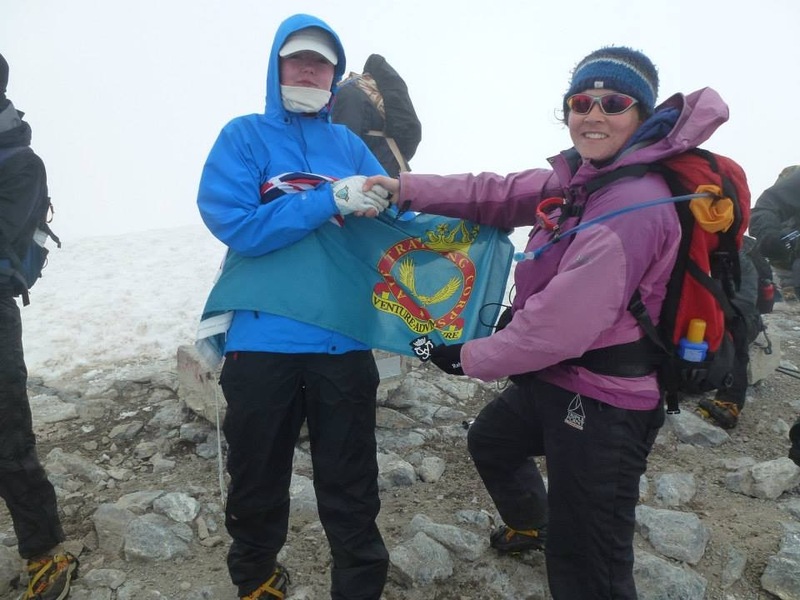 Sgt Luke Cordas – Once we finally reached the summit it was a great achievement for all of us, and quite a scary one as it was still so very windy. Lots of photos were taken, despite the lack of view due to poor weather conditions, and the flags were also taken out (I think getting charity t-shirts out/on would have been quite a cold idea!!). Today was another early start, with heat inversion to start the day, we were taking the GR11 which was easily marked with red and white paint or signs. The day took us along the Valle de Ordesa, we took the route which went along the valley to see, listen and take photos of some amazing and powerfull waterfalls. By lunch time we had made it to Pradera de Ordesa which the cadets really enjoyed having a few ice creams, and we were able to empty the rucksacks of any litter from the past few days. We continued along the GR11, which then takes up the Valle de Bujaruelo, a route which is mainly concrete and a road up to the hut we were staying in that night. We were able to have a shower and tidy up from the last 3 days, able to use the local wifi to catch up with parents and update the facebook and twitter feeds. Evening meal was in the restaurant for a 3 course meal and an enjoyable evening had by all. 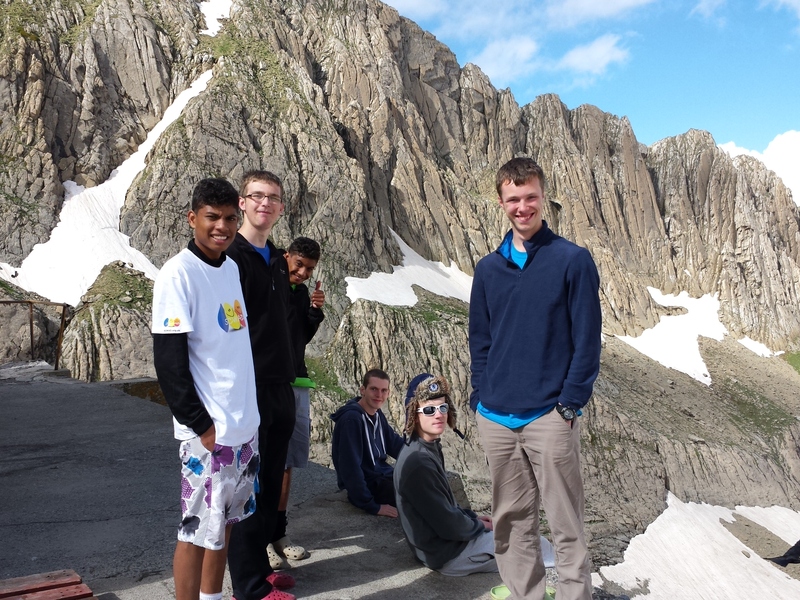 Cdt Goddard – We walked the entire length of the Ordesa Canyon. We had a great journey following the yellow brick road! The final day of the trek and the sun and amazing views finally made an appearance from start to finish today. Shorts on, sun cream and plenty of water to effectively walk up hill to the French/Spanish border. This was probably the hardest day due to the heat which gave us opportunities to stop and soak up the mountains and reflect on the last few days walking. Taking photos at the border and then realising you only had 20 minutes left to reach the cars for the drive back and completion of the trek was hard to take, but the realisation you have taken cadets around the Pyrenees to add to their life experience and pass on what you love doing, being in the mountains and achieving your goals. Once back at the cars taking the final team photos we made our way back to the hotel to pick up our bags, for the cadets to have a look around Gavarnie. We then made our way to St Luz where we would be staying for the evening, we got ourselves cleaned up and ready for an evening meal and another round of lentils. Cpl Harper – We were granted a breath-taking parting view of the Ordessa Canyon as we climbed the final hill. When we reached the top we saw a familiar signpost. It was the same one that we had seen on the first day, only twenty minutes into the walk. Today we had a lazy morning, breakfast and look around St Luz purchase any gifts to take home. We then made our way back to Toulouse airport, to wait for the flight and head back to Bristol. The coach journey home was a little longer with a lorry fire on our normal route home. So arriving a little late parents waiting to pick up and cadets very happy and accomplished with their achievements. Cpl Harper – The experience of walking in the Pyrenees is one I will never forget. Every day provided another amazing sight and experience, and every single member of the team provided too many hilarious moments to count. Every single step was memorable and the cliffs were breath-taking. I would grab the opportunity to go back immediately and actively encourage any cadet who can do something like this to do so. FS Bird – I will always remember that on the 6th July 2014 I climbed Mount Perdido with 633 Squadron right to the very top! This is definitely a life changing experience and one to tell to the next generation of cadets joining our amazing squadron which is growing in reputation. Sgt Clayton – I have enjoyed this entire trip immensely and I am definitely safe in the assumption that it has been THE best time I have had in my entire time with the ATC. We had all expected to enjoy the trip but I don’t think we quite knew how much. My favourite moments were surprisingly not that of the expedition itself although it certainly had its highlights. No, it was that of the nights that followed and the time spent just talking about absolute rubbish and making stupid jokes with my friends who I believe have become much closer and I now know far better than I ever have before. In essence the highlight was not the spectacular views or the enormous feeling of achievement held by all when summiting mountains but the bringing together of a team and of good friends. Sgt Cordas – Overall, the trip for me was such a fantastic experience and one that couldn’t have been done without our amazing staff Flt Lt Woodham, Mstr Aircrew Russell and Keith Gault – whom the whole team are extremely grateful for! As well as that, the team couldn’t have done such an amazing feat without each other who worked well as a team to complete the trek!